This is an easy and versatile pineapple vinegar that I add to many things, including my fermented ketchup. 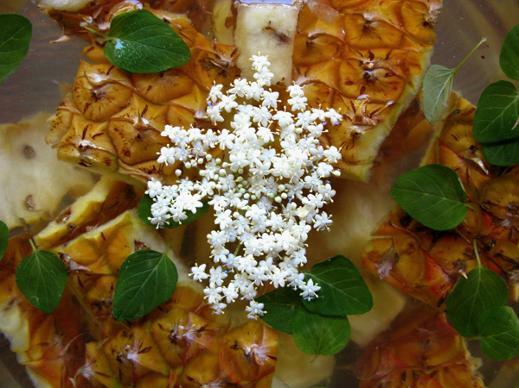 A West Indian staple that is likewise used in many things, this live vinegar is the fermentation starter for traditional cortido (a Latin American variant on the sauerkraut theme). This recipe is my take on a recipe in Sally Fallon's book Nourishing Traditions - it's a bit different, and no whey is used. Place all the ingredients in a large glass bowl, cover, and leave out in the light for 36-48 hours. Strain and decant into bottles or jars and seal. If it is a very lively brew (and they can be), release pressure a few times over the first few days. This needs to be used fresh, and will keep in cool storage for 2-4 months.